This essay explores the place of heresy in medieval society, touching upon the theories of Robert Moore that the language of disease is often used to describe heretics. In the first chapter this is developed by looking at medieval sources used in the study of heresy and medicine. The influence of Church chroniclers is discussed, giving some suggestion of the bias that can be encountered in later medieval sources. Also explored is the existence of medical journals in the Middle Ages, as well as sensational popular accounts of epidemic illness. Following this, a detailed summary of medical practice and the position of the physician in medieval society is given. The influence of the Church and faith healing, as well as traditional or unconventional remedies, are all shown as an integral part of medicine. As an extension of this, the third chapter explores mass epidemics to consider popular opinion of more threatening disease. Particularly focusing on ergotism and insanity, this chapter considers how the role of medical care was pushed to the sidelines by more dramatic sources. Leprosy is then explored as more than an illness, where the impact of traditional literature meant it could be used as a powerful symbol for political purposes. 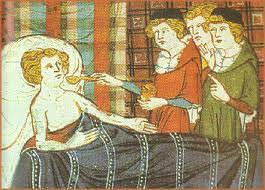 In the final section, the evidence for heresy as a disease is explored considering the context of medicine in medieval society, specifically looking at leprosy but also considering elements of other epidemics and treatments as a whole. The conclusion drawn is that the language of disease used to describe heresy represents a literary divide from actual medical care in the Middle Ages. Heresy may be used as a powerful metaphor linked to devastating epidemic but is not necessarily linked to illness itself.